The Kvatch release area is divided between the rainy lowland pass in the south and the rocky Highlands of the north. The southern area is a wide grasslands with its own Region designation(The Kvatchi Pass) which connects the coastal areas with the fertile interior plains. Notable locations in the Pass, like Kvatch and Fort Istirius, lie on their own reinforced hills which overlook the surrounding land. Small farmsteads crowd around the Gold Road. The northern area is part of the Colovian Highlands region. The land grows more inhospitable the higher north you go: while the southern foothills still harbor three small villages the north is mostly devoid of life (save for the occasional goblin tribe or lost Minotaur). In fact, the area close to the Hammerfell border is designated as the Imperial Reserve, one of the private estates of the Emperor. The local villages,Hal Verovar, Vincherik, and Shardrock, are impoverished mining, logging, and goat-herding settlements. They are ruled by Colo-Nordic lords who live in cliff-fortress estates nearby. The map below shows mostly Oblivion locations. Existing fort ruins have been converted to Colo-Nord estates and villages. The map is currently still lacking Colovian Barrows and Second Empire ruins.The north should feature several more failed mines. Open-pit mines and large stone quarries could be interesting landscape designs, and hint at the faded industrial glory of the region. I like that these 4 settlements are relatively close to each other (3-5 cells distance). It seems quite comparable to vanilla distances between towns. There is a significant amount of void between Hal Verovar, Hal Vincherik and Sutch. It would make sense to encounter at least a remote hamlet in the middle between these three. I don't know if ruins and caves can really add enough interest to this area. The area northeast of Hal Vincherik needs points of interest aswell. As a rule of thumb, I would not to let voids become larger than 3x3 or at worst 4x4 cells. If you have larger areas than this with nothing in them, you will have quite some purpose-less exterior space and the landmass becomes subjectively much smaller to the player, since there is no interruption to the journey. We'll probably not have empty areas of this size anymore as soon as tombs, caves and bandit camps have been added, though. I think everything above cell 40y should be uninhabited wilderness, similar to the Ashlands on Vvardenfell: a hostile adventure zone to counter the more civilized southern areas. We could add a small mining settlement controlled by a Curia Prefect west of Hal Vincherik. Other points of interest could be logging camps, campsites of Redguard nomads, or isolated monastery settlements. I'm reluctant to add more villages than is strictly needed: a town is a big investment of time. Besides, Colovia is supposed to be somewhat underpopulated (at least, relative to the east). Added a POI to the northwestern corner: a prospective mining/quarry town, governed by the Imperial Curia. The ruling Prefect is also entrusted with the management of the Emperor's personal hunting grounds, the Imperial Reserve, which stretches all along the northern river. It is forbidden for common Imperials to hunt, settle, or exploit the land there without the Emperor's permission. This is a sore point with the local Colo-Nordic lords, many of whom had to give up land to the Reserve. The town is very new, and it is a source of great frustration to the Colo-Nords that the Curia managed to gain settlement and exploitation rights which have been denied to the locals - especially in the sacred Highlands. Colovian Barrows: most barrows are near settlements, as they were once used by the local nobility. At least two barrows lie at the base of the hill of Kvatch: these are said to be resting places of the founder saints, who feature prominently in local folklore. Imperial Forts: beside Fort Istirus and the Gold Road tollhouses, there is a small watchtower in the far north. The tower is isolated, assignment there is sometimes used as a punishment for Legion soldiers. Might feature in Legion questline. 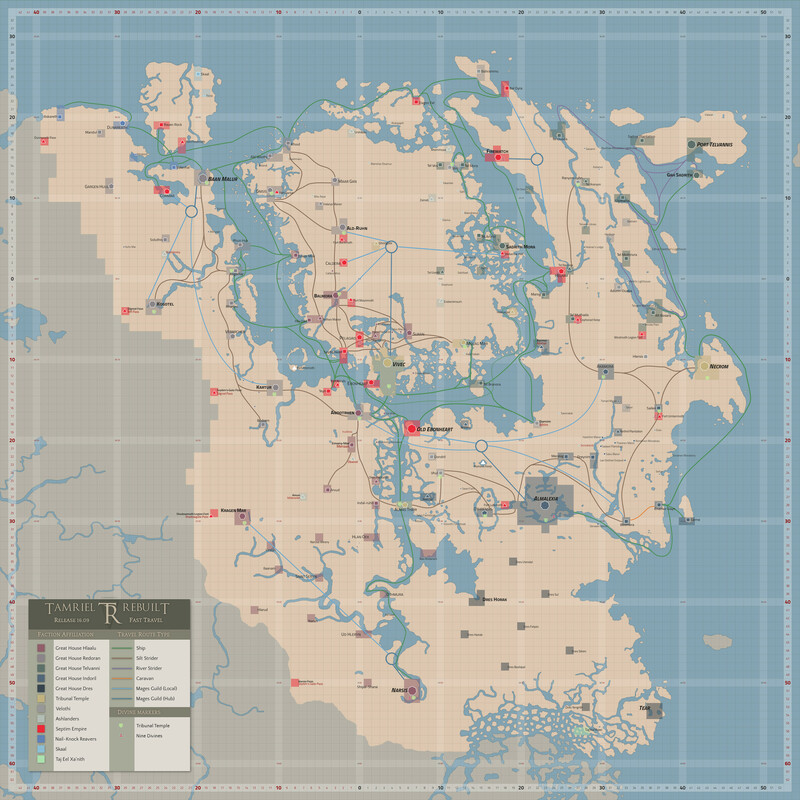 Mines: northern Kvatch used to be mining country, though most places are depleted. There are three mines in the far north which had to be closed when the Emperor declared the area his personal Reserve. The still functioning mines are under Curia control. More failed and functioning mines can be added to the map: exterior makers could consider the possibilities of open mining pits and quarries. Old Imperial Ruins: most of these were once cliff-fortresses of Colo-Nordic lords, abandoned after their ruling families went extinct or bankrupt. Those in the far north were abandoned with the clearing of the Reserve. There are still a couple of very angry penniless Colo-Nords in Kvatch related to this. Settlements: a fair number of small farmstead lie along the Gold Road: these are mostly focused on husbrandry. The Kvatch vineyards are also among these. Further to the north, we see the estates of the Colo-Nordic lords: these are cliff-fortresses, usually close to the villages they defend/control. Some, like the Hastrel estate, have no village to control. The northeastern corner of the map also features a temple or monastery of some sort, perhaps dedicated to Emperor Zero or one of the Akatosh splinter cults. Campsites: idk just threw a couple of them around. This work is much appreciated. It is nice to have this sort of extensive planning going on in advance.